Join us on Thursday, January 25th at 7pm, as Book Culture on Columbus and Harper's Magazine present Mr. Fish, author of And Then the World Blew Up, in conversation with Chris Hedges. 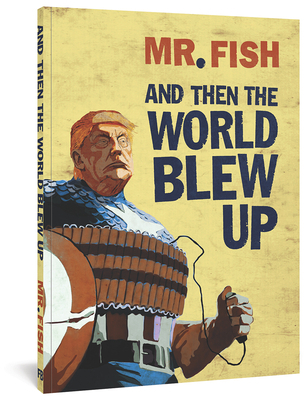 A collection of disturbingly hilarious cartoons and essays that speak truth to power in this bonkers political era. What do you get when you cross a fistful of pens and an enormous stack of blank paper with somebody who resents the sweet-smelling muzzle of good manners and polite conversation, who delights in always saying the wrong thing at the right time in contempt of every expectation that the naked truth is at all obscene? This is a collection of cartoons, illustrations, personal essays, culture-war correspondence and interviews with famous intellectual and artistic outlaws, who, like the author, are just trying to defuse the apocalyptic bomb that is the miracle of our Creation. Drawn, painted, and collaged in Mr. Fish's many virtuosic styles, And Then the World Blew Up is an eloquent take-no-prisoners response to American political life. Mr. Fish lives in Philadelphia, PA. His work has appeared in Harper's, Truthdig, The Nation, The Village Voice, The Atlantic, and the LA Times. In both 2010 and 2011, he was awarded the Sigma Delta Chi Award for Editorial Cartooning He also won the Grambs Aronson Award For Cartooning With a Conscience in 2012. Chris Hedges is a Pulitzer Prize-winning journalist, New York Times best selling author, former professor at Princeton University, activist, and ordained Presbyterian minister. Hedges was part of a New York Times team of reporters awarded a Pulitzer Prize in 2002 and also received the 2002 Amnesty International Global Award for Human Rights Journalism.